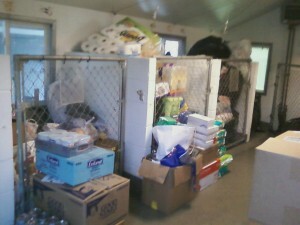 .. the shelters and rescues were forever grateful and amazed at how generous our supporters are. WE weren’t surprised at all because we know our supporters are amazing! Our hearts and prayers go out to all those who’ve been affected by Hurricane Sandy. We continue to accept donations for the people and pets as some of our rescue friends will be traveling down to assist next weekend. So if you have items to donate please feel free to drop off at our shelter and we’ll make sure they go with one caravan or another… Again… Thank you and we hope you will view the video to see just how much the donations benefit those who lost so much. Check our website to see when our Hurricane Survivors will be available for adoption…we rescued 3 dogs and 1 puppy hoping to find them loving new homes.